From August 30, 2018 to March 15, 2019, the vacant spaces of Notre-Dame Street West in Saint-Henri will be looking for their soul mate with, in the key, $ 100,000 ranging from $ 15,000 to 35,000 $ for entrepreneurs who will succeed in seducing them. 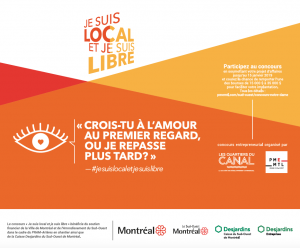 The Business Organization – Les Quartiers du Canal and PME MTL Grand Sud-Ouest are proud to present the entrepreneurial contest “I am local and I am available” / “Je suis local et je suis libre”. Notre-Dame Street West is a commercial street which had eleven months of construction (water sewer, surface redevelopment, and electrical network) between Atwater Avenue and St. Augustine Street in 2016/2017. The street is now beautiful and engages itself in a seduction operation with entrepreneurs. 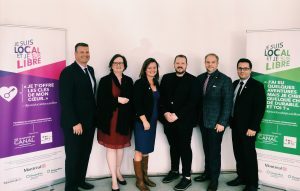 From left to right : M. Éric Prud’Homme, CEO, Desjardins entreprises Ouest de Montréal, Mme Christiane Oligny, CEO of Caisse Desjardins du Sud-Ouest of Montréal, Mme Marie-Claude Dauray, CEO PME MTL Grand Sud-Ouest, M. Jean-Michel Gadoua, President the SDC-Les Quartiers du Canal, M. Benoît Dorais, Mayor of Arrondissement Le Sud-Ouest and président du comité exécutif de la Ville de Montréal ainsi que M. Robert Beaudry, membre du comité exécutif responsable du développement économique et commercial. The contest “I am local and I am available” invites entrepreneurs to select, according to their preferences, the premises with which they wish to engage. But be warned, only serious suitors can apply. The local spaces will have signs in their window to let potential soul mates know what they are looking for: “I have been around the block a few times, but now I’m looking for something sustainable. And you? We will be able to read on one of the windows of vacant premises, while another will say: “Do you believe in love at first sight, or will I come back later”? “Notre-Dame Street West and all our commercial streets have a real commercial appeal in Little Burgundy and Saint-Henri, with a vacancy rate of only 4% and more specifically 7.28% for the area covered by this contest,” stated Jean-Michel Gadoua, President of the Business organization -0 Les Quartiers du Canal. “In addition, the upcoming opening of several new businesses demonstrates a real economic dynamism. We hope that the “I’m local and I’m available” contest will reinforce this attraction by giving new entrepreneurs the opportunity to enjoy the excitement of our business destination.” he said. 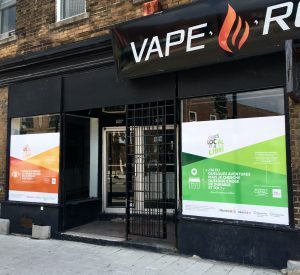 Entrepreneurs burning with desire to start a business on Notre-Dame Street West will have until March 15, 2019 to submit their entrepreneurial project at pmemtl.com/south-west/concours-notre-dame. 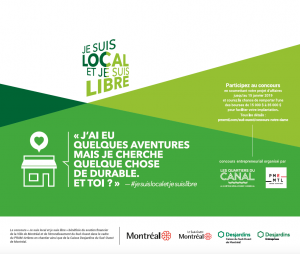 The “I’m local and I’m availble” contest is financially supported by the Ville de Montréal and the Sud-Ouest borough as part of the PRAM-artères en chantier and the Caisse Desjardins du Sud-Ouest de Montréal as well as Desjardins Entreprise Ouest of Montréal.